Its taken me a month to finally begin writing this blog post, mainly because I wasn’t sure what I’d say since I have had so many emotions and thoughts rushing through me. As many of you know I recently took a trip to Germany, a trip which I have wanted to take for most of my life. Both of grandparents on my mother’s side were born in Germany. I am the granddaughter of Holocaust survivors, I’ve talked about the Holocaust all my life and from a young age had an immense curiosity for anything and everything WWII or Holocaust-related. I read books, watched documentaries/movies and know the stories of so many who perished and also of those who survived. Growing up I knew that both of my grandparents had managed to escape before things escalated in Nazi Germany – but that almost none of their families survived. My grandfather rarely spoke about his life in Germany, and my grandmother died when I was only 5 years old. So I knew very little about the family I never met nor the lives they had in Germany before hatred, ignorance and intolerance consumed and took their lives. 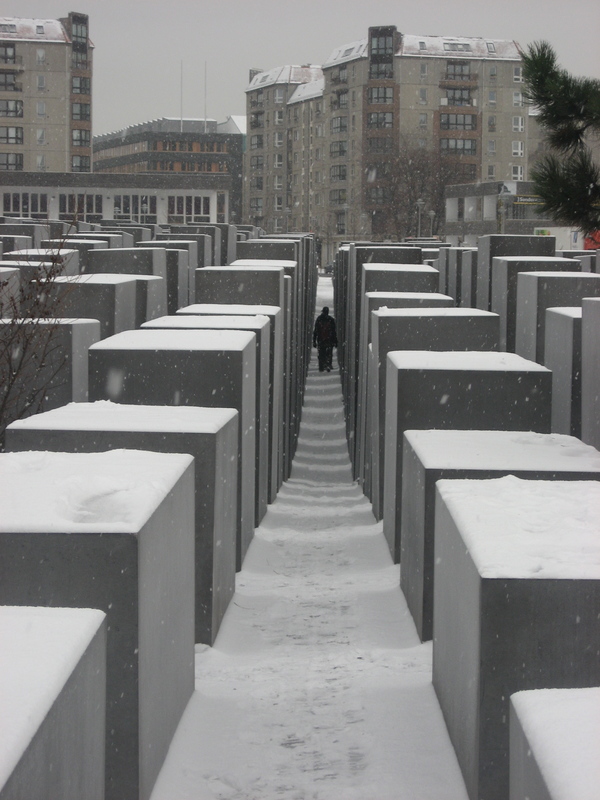 I saw this trip as an opportunity to learn more about my family and while many Jews still boycott German products and would never step foot on German soil I hold no such disdain for Germany as it exists today nor its citizens. 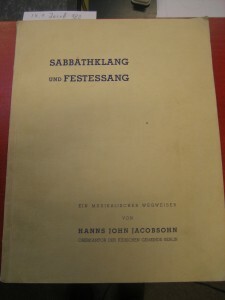 In fact, it was a researcher from the University of Hamburg, Sophie, who first contacted my mother to gain and share information on her grandfather (my great-grandfather), Hanns John Jacobsohn. 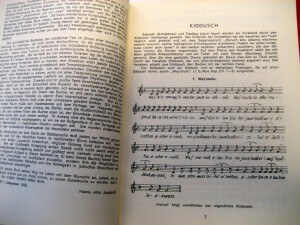 She had been conducting research the past few years on German Jewish Musicians during World War II. 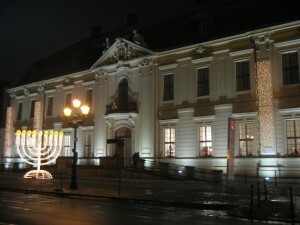 My great-grandfather had been an opera singer and Cantor at the Progressive (Reform) Jewish Synagogue in Berlin. While my grandmother had been able to escape Germany at the age of 13 via the first Kindertransport to Great Brittan and her mother was able to follow later and secure a Visa to England through family, my great-grandfather was not so fortunate. I contacted Sophie to see if she could possibly meet while I was in Hamburg and we agreed to have dinner when I first arrived. I learned from her that the primary reason Hanns could not secure a Visa was that he was born in Poland when it had been a part of Germany, and as a Jew of Polish origin his papers were not accepted or recognized by most governments. He attempted to secure Visas to South America, England, the United States and lastly Shanghi, China, but his requests were met by deaf ears. I was shown handwritten biographical documents that my great-grandfather had prepared in English during his attempts to gain a Visa to Great Brittan. They told his life story and spoke of his accomplishments as a singer and cultural leader within the Jewish Community in Berlin and even mentioned that he served and fought in WWI. He was appointed High Cantor of Berlin in the early 1930s and often traveled to aid Jewish communities who had no religious leaders, until the Gestapo banned him from traveling back to those smaller towns. It was wonderful to learn about all the good he had done in service of the Jewish community to keep alive the Jewish culture and music during the war. He was arrested on Kristallnacht and later released, but was unfortunately also arrested 4 years later in 1942. I learned that this arrest was due to a bombing attempt and as a result a few hundred Jews were randomly selected and rounded up to be sent to Sachsenhausen Concentration Camp. He was shot only 10 days after his arrival at the camp. So when we arrived in Berlin a day and a half later it was eerily haunting, yet illuminating to be where my grandmother’s family once lived. 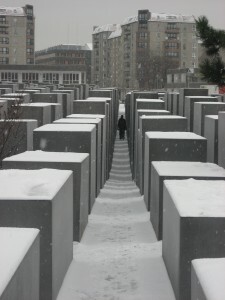 As a history buff Berlin has a lot to offer – especially with regards to WWII and Communism. 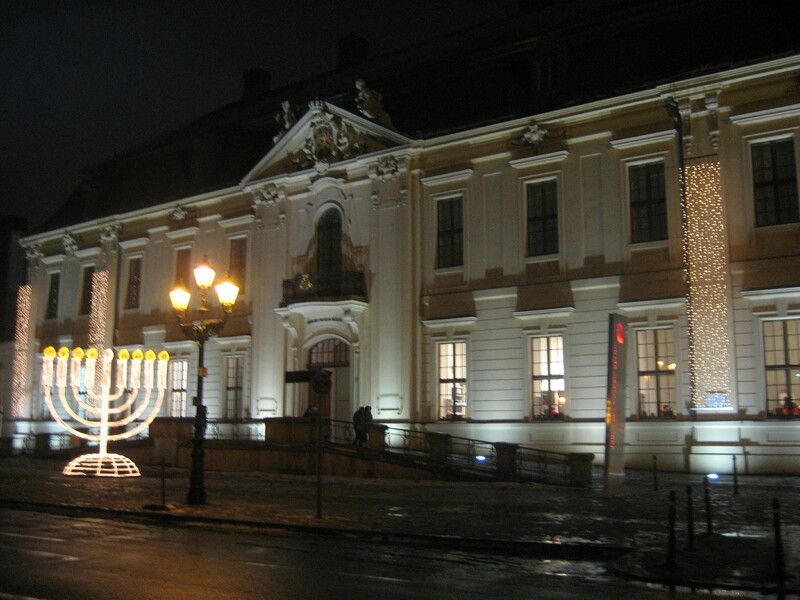 While I was there I visited the Berlin Jewish Museum and got special permission to visit the Library and Research Center that was located in a separate building. Here the research librarian helped me look for any information they might have on my Great-grandfather. At first our searches pulled up nothing – he wasn’t even listed in the phone book, a huge surprise given the German reputation for record keeping. He was mentioned in a book on Jewish musicians, but only in passing as co-director of a Jewish Children’s Choir and male vocal lead accompanying a famous Jewish soprano. 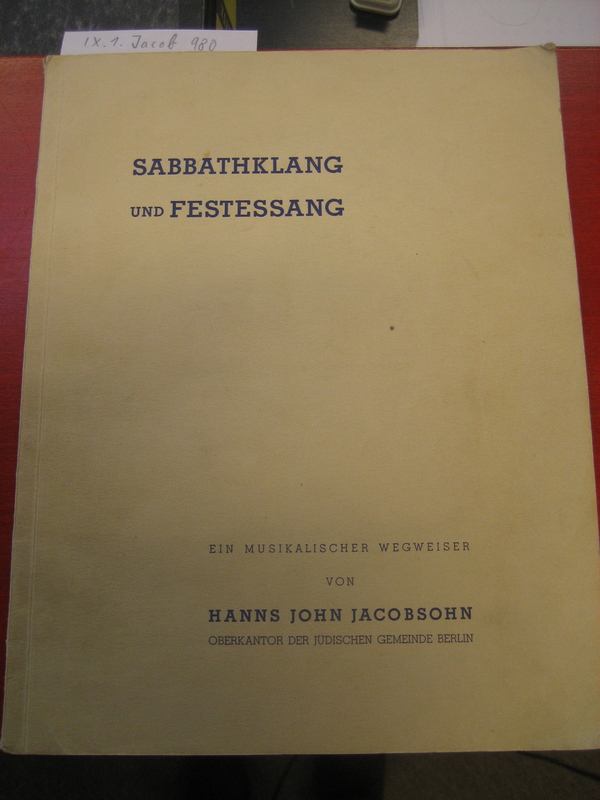 But, after much searching we found a set of Jewish musical recordings from 1900-1932 — and two 1929 recordings were of Hanns John Jacobsohn singing the Hanukah blessings and U’W Nuchau Jaumar. I’m a little ashamed to admit this, but I was extremely nervous to hear him sing for the first time. As a fellow singer I sometimes can be a harsh critic and I was scared that I wouldn’t like his voice. That all changed as I sat there with headphones over my ears -because as he began to sing tears started to immediately fall from my eyes. I sat there in silence and listened to both songs. 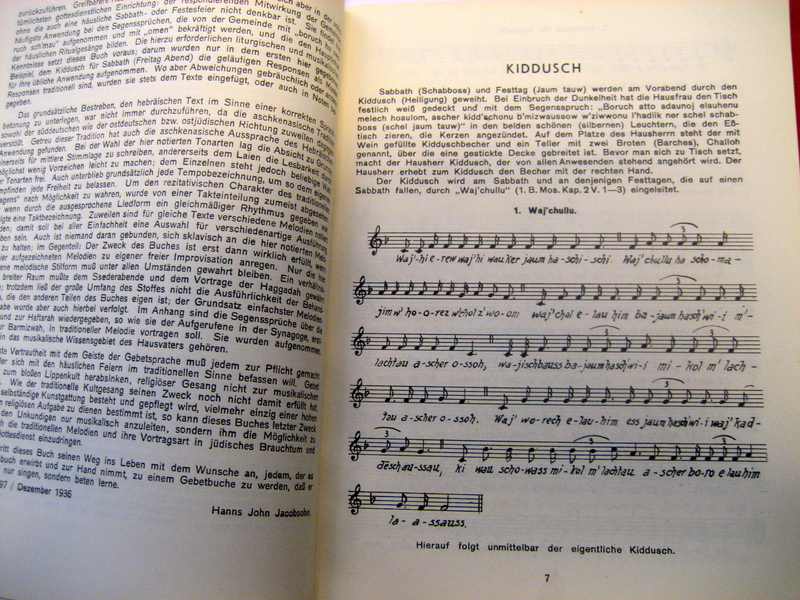 Afterwords, we found a published Shabbat song book written by my Great-grandfather (pictures shown above) with the forward printed in German and the music handwritten by him. The Librarian gave me a CD with copies of the two songs and later I was fortunate to hear him sing one of my favorite songs “Lecha Dodi” when I was exploring the museum. I recorded it on my camera and you can listen to it below. We were in Berlin for 3 days and I had the option of going to the Sachsenhausen Concentration Camp, but I couldn’t. At this point I think going to Auschwitz would be easier – because I’m just not ready to go to the camp where my Great-grandfather was killed. Not after I’ve just started to know more about him. The same goes for Bergen-Belsen where I’ve been told my Grandfather’s younger sisters died. I thought maybe I’d be ready, but I was wrong – maybe I never will be.